So today I got all fired up to write an AMAZING blog post but then figured out that I had a speaking event, two client meetings and about 1,000 emails. Sigh. So I am signed up for a website called Flylady.com which tells you how to keep a house well (I am organizationally challenged which is why I have such stringent systems for my business). While I do like some of the tips, mostly I like her motto which is “housework done incorrectly still blesses your family”. Those of us who are frustrated perfectionists can understand this immediately. It can seem like doing a post that is not a great seo post, that is published at 6:09 Mountain time is a waste. But it is not really. I truly believe that doing what you say, no matter if it is perfect is important. During my speaking event, a lady asked about social media and if she should do one really well or all of them (Facebook, Twitter, LinkedIn, Google Plus and Pinterest) a little bit. I think she wanted to hear that doing one perfectly was the best bet. Of course I said, do all of them! It is tempting to do the one that you like the best, but your potential customers are actually on all of them and you are leaving a lot of opportunity on the table if you only do the one you favor. Another thing for this topic is that A LOT of my traffic in the coming year will come from the posts that I write this month. Every day when I try to shoehorn a blog post in around presents for the kids, decorating, oh and work, I think about that. Doing the day-to-day stuff is hard and where most people fail. 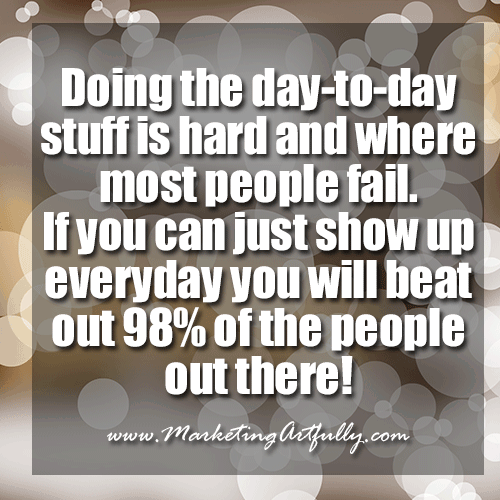 If you can just show up everyday you will beat out 98% of the people out there!